Sometimes a project takes longer than it should to land in the Hackaday in-tray, but when we read about it there’s such gold to be found that it’s worth sharing with you our readers despite its slight lack of freshness. So it is with [Andrew Back]’s refurbishment of his Quad electrostatic speaker system power supply, it may have been published back in August but the glimpse it gives us into these legendary audio components is fascinating. An electrostatic speaker is in effect a capacitor with a very large surface area, of which one plate is a flexible membrane suspended between two pieces of acoustically transparent mesh that form the other plates. A very high DC bias voltage in the multiple kilovolts region is applied across the capacitor, and the audio is superimposed upon it at a peak-to-peak voltage of somewhere under a kilovolt through a step-up transformer from the audio amplifier. There are some refinements such as that the audio is fed as a push-pull signal to the opposing mesh plates and that there are bass and treble panels with different thickness membranes, but these speakers are otherwise surprisingly simple devices. The problem with [Andrew]’s speakers became apparent when he took a high voltage probe to them, one speaker delivered 3 kV from its power supply while the other delivered only 1 kV. Each supply took the form of a mains transformer and a voltage multiplier board, so from there it became a case of replacing the aged diodes and capacitors with modern equivalents before applying an insulating layer for safety. 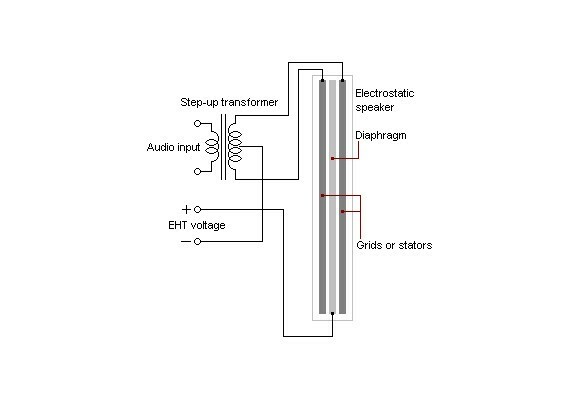 Electrostatic speakers are no stranger to Hackaday, we’ve taken an in-depth look at them in the past. You may also find some of our colleague [Steven Dufresne]’s writing on the matter to be of interest, on measuring high voltages, and his experience wrangling high voltage. PCB design tools usually have a way to alter the size of the cream/solder paste layer of a design, and indeed one option is to simply shrink the size of the paste layer elements. The trick to the wedges is increasing the total distance between solderpaste blobs while keeping the total amount of solderpaste high. This technique can be used down to 0.5mm pitch parts, and everything works like a charm. While this is a little outside of our wheelhouse here at Hackaday — it is, after all, a novel use of existing tools that is mostly applicable to electronic design and production. [Ed Note: Sarcasm.] You can check out a few pics of this technique in the slideshow below. If you test this technique out, be sure to let us know how it went!